I didn't immediately become a fan of The Office. I loved the BBC's Ricky Gervais original series, but when I finally watched the first season of the US version, I was hooked. 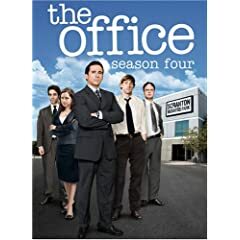 The fourth season of The Office is out tomorrow. Television series seasons dominate this week's DVD release list. The third season of Jennifer Love Hewitt's Ghost Whisperer, the fourth season of Desperate Housewives, and the third season of Supernatural are all either on my shopping or rental lists. Most interesting is the Richard Benjamin science fiction series Quark, an offbeat science fiction spoof. Beyond the reissue of Bright Lights, Big City, I don't see many outstanding feature films out this week (besides Transformers special edition with an Optimus Prime Mask, which I would want just for the mask). Any recommendations from this week's DVD releases?